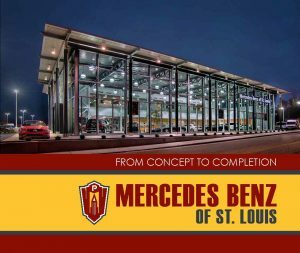 PARIC completed construction on the new Mercedes Benz of St. Louis car dealership in St. Louis, MO in July of 2014. The facility was relocated from its former location in Ellisville to be more centrally located for customers. Much of the facility, including the service garage, was constructed underground due to limitations on above-ground space on an urban site. The structure consists of a 60,000 sq. ft. cast-in-place concrete structure for the service area and showroom, as well as a 34,000 sq. ft. parking garage for the storage of additional vehicles. Due to 24 feet of elevation change in a tight area, the project required creative site planning and multiple floor levels to address the client’s various operational needs. The design honors the corporate prototype, while modifying the design enough to create an independent look. The building’s exterior is made up of curtain wall and metal panel systems, and the interior is comprised of a mix of exposed steel and high end finishes. As commercial builders, PARIC has finished many other projects in the city of St. Louis. We have also been busy building commercial properties in many other cities throughout the country. We built the Belterra Park Gaming & Entertainment Center in Cincinnati, OH, the River City Casino project in South St. Louis County, Missouri and the Lofts of Washington University on the Delmar loop. The Lofts of Washington University consists of over 200 apartments, a grocery store named United Provisions, a diner which is named the peacock diner, and underground parking. The parking consists of over 200 parking spaces. PARIC self-performed the concrete package as well as the carpentry work.